The result of this manicure is totally unexpected, but I love it so much! Noticed about my nails are much longer than other recent postings? This manicure was done approximately a month ago and I didn't get time around to write it up. 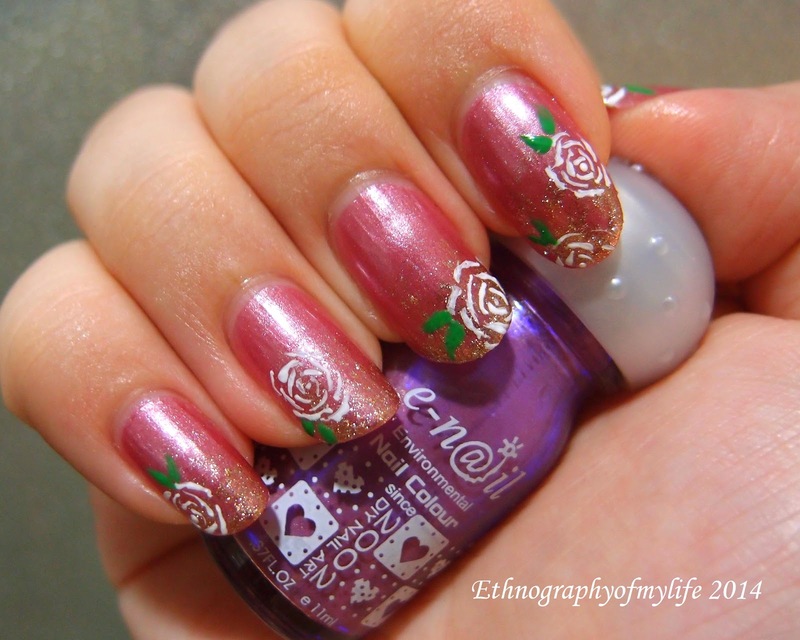 The color is called Rose, April monthly special of E-N@il. It's a beautiful purple/pink reflective shimmer color. I was disappointed in the first place, because it was very sheer. However, sheer polishes are suitable for more build ups! I decided to free-handed some roses to contemplate with it! I really really love this look. It's just so amazing to see the roses with some champagne golden sparkle tips and the roses on the top. I am looking forward to use Rose again ASAP!